Best Solution Center Software, fix PC errors in 3 Steps! Smart Solution Center Pro can speed up all kinds of Windows systems to their best performance. Smart Solution Center Pro is recommended by many experts and users as the world\'s best registry cleaner. It is a must for your daily computer maintenance. Running Smart Solution Center Pro on a scheduled basis will result in a stable system and will greatly enhance system performance. What are you waiting for? Simple procedure, amazing effect! 1. Download and Install Smart Solution Center Pro. 2. Click "Quick Scan" button to Scan Your Computer. 3. Click the "Repair All" button and then the problem will be gone completely! Smart Solution Center Pro is the program that can be immediately downloaded and works through giving a quick scan on the entire drive while automatically repairing the problems in it. seeing to it that no unwanted fragment or program will be left behind and will then automatically download the brand new software which might be needed by the user. Lastly, it will also fix any error and optimize the drive in order for it to work faster than it was before. One of the primary benefits that can be enjoyed with this type of regularly cleaning the computer system will not just be seen in the system\'s computing speed but at the same time, there will also be lesser risks of losing any essential data and help in ensuring that the hard drive can last much longer. After the repair, users will not only notice an instant change in speed of the system but at the same time, there will also be lesser cases of freezing, reduced system errors as well as a renewed general computing and speed power. Smart Solution Center Pro is also one of the top ranking registry cleaners especially dedicated for fixing computer errors and optimizing system settings. Over 9,500,000 people have already chosen Smart Solution Center Pro to fix PC error! Try it now for FREE! You won't be disappointed and you will enjoy many automatic fixes and can manually fix all system problem! 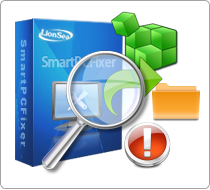 * Smart Solution Center Pro will fix PC errors in 3 Steps!